According to new research humble, microscopic organisms can create dripstones in caves. This illustrates how biological life can influence the formation of Earth's geology - and the same may be happening right now on other planets in space. According to traditional textbooks dripstones are created by geological or geochemical processes with no influence from living organisms. But now scientists report that formation of dripstones can be a lot more complex than that: Sometimes microbes are responsible for the formation of these geological features. 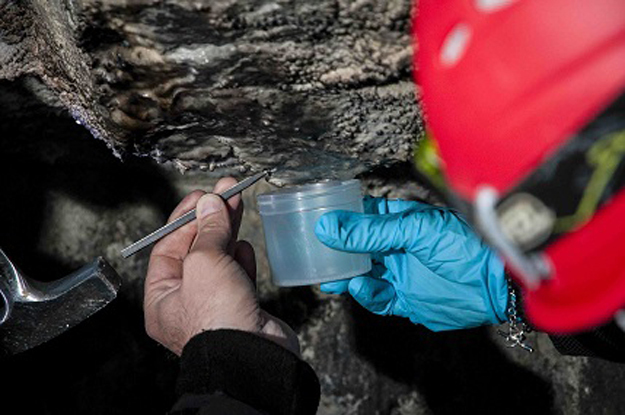 The researchers from Denmark, Sweden and Spain have investigated dripstone formation in a Swedish cave and conclude that microbes play an active part in their formation. "If microbes can be responsible for dripstone formation on Earth, the same thing might be happening other places in space", explains researcher Magnus Ivarsson from Nordic Center for Earth Evolution (NordCEE) at University of Southern Denmark. The planet Mars is known to be home for a number of caves similar to caves with dripstones created from microbes on Earth. If there are dripstones in these caves, they might have been formed by microbes and thus they are an indication that biological organisms have once lived on Mars. "If I were a microbe I would definitely live in a cave on Mars", says Magnus Ivarsson. He and his colleagues have reported their findings in "International Journal of Speleology". The colleagues are Therese Sallstedt from NordCEE, University of Southern Denmark, Johannes Lundberg from Swedish Museum of Natural History, Rabbe Sjoeberg, retired from Umea University and Juan Ramon Vidal Romani from University of Coruna in Spain. The researchers examined dripstones in the Tjuv-Antes cave in Northern Sweden. The cave is 30 meters long and it is home for various kinds of dripstones. When they examined the dripstones the researchers saw distinct layers, mirroring how the dripstones have grown over time and left seasonal layers. Dark layers consist of fossilized microbes and light layers consist of calcite. The researchers conclude that the microbes were active in the formation of the dripstones. "Microbes actively contributed to the formation of the dripstones. They didn't just live on the surface of them", says Magnus Ivarsson. The layers indicate that the microbes were most active in spring and summer when rain dripped down through the soil and into the cave. "These drops of water brought nutrients with them, which was consumed by the microbes. As the microbes metabolized they excreted calcium which precipitated and in time helped form the dripstones", says Magnus Ivarsson. "Without this microbial activity dripstones would be smaller - or maybe even totally absent", he adds. "Everyday millions of people go into underground caves; metros, train stations, etc. These artificially constructed caves offer some of the same living conditions for microbes as naturally created caves. Health authorities are therefore interested in monitoring and understanding what kind of pathogenic microorganisms can live and grow on the walls of for example metro-stations", explains Magnus Ivarsson. Together with Swedish colleagues Magnus Ivarsson is involved in monitoring microbial growth in metro-stations in Stockholm. Contact Magnus Ivarsson, Nordic Center for Earth Evolution, magnus.ivarsson@nrm.se, +46 70 2428687.